UPDATE 05/27/05 : My bats are back! I noticed a little bit of Guano under my simple plywood house. From the looks of it, I only have a single visitor which is common for my houses. I continue to have bat visitors each season. I don't think I get more than one or two, but I'm happy to have them. I still get more evidence of visitors on the North side of my house than I do in the actual bat houses that are attached to the South side of my house. This seems to be contrary to the published advice that I have read. Bats are supposed to like getting early morning sun, but where my most common visitor resides up in the eaves there is never any direct sunlight. UPDATE 06/03/01 : My bats are back... I first saw signs of bats in both my small bat house and up in the eaves in mid May. So far their vists have been sporadic, but I'm hoping that last years permanent resident will return. UPDATE 10/04/00 : My bat season is over, but it was my most successful yet. 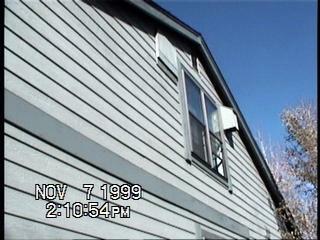 I had occasional residents in my bat houses and a permanent resident up in the eaves. Here's a picture of my permanent bat taking off for the evening. I hope he'll return in the spring. UPDATE 08/12/00 : Hmmm.... Now I'm really perplexed... My bat house must be in the wrong neighborhood because all it seems to attract are transients. A day here, a day there and off they go. 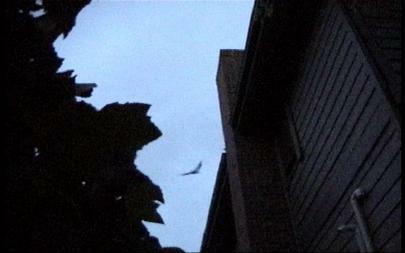 But now I've noticed that I have at least one permanent bat up in the eaves of the Buzbee house! Don't they know that I built two bat houses just for them? Noooo... they have to crawl into a little crack in my house. It's even on the wrong side. The experts tell me that bats like Southern facing roosts that catch the morning sun, so that is where I placed my bat houses. But the new bats must not have been listening, because they roost on the North side of the Buzbee house... My wife likes this arrangement even more. UPDATE 05/22/00 : They'rrre Baaaccckkk... My bats arrived right on schedule last night. Gee, it's just like the swallows at San Juan Capistrano! My wife is thrilled! . UPDATE 02/25/99 : My Bat House is back on-line ! It's now running at 400 Mhz with 128 Meg of Ram and six temperature probes that I can to hook up ! Six temperature probes ? Did I lose my marbles along with my Mother Board ? Stay tuned ! UPDATE 01/23/99 : I've had a mother board crash on my Bat House (Don't you just hate it when your Bat House mother board crashes ?) So, until I get it fixed, I'll be without a current Bat House temperature ! Is it hot ? Is it cold ? I don't know ! 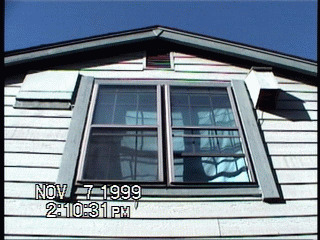 UPDATE 07/05/98 : Another year has passed and I still don't think I have any bats in my Bat Houses. I have a hard time seeing into my newest bat house so it's possible it has occupants. Thanks to Tony Messina I have a bat detector to monitor the area and I have heard bats in my backyard at night. I just don't know if they use my bat house. I'll keep on monitoring !